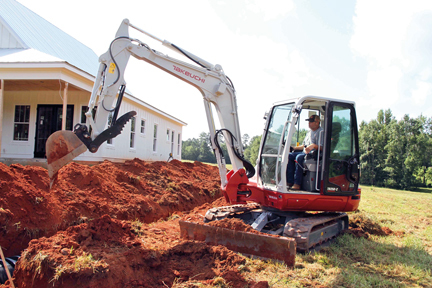 Takeuchi-US recently announced the release of its newest compact excavator, the TB250-2. Weighing 4970 kg with a canopy, the machine provides Takeuchi with a true 4.5 t excavator offering that is well suited for a wide range of applications including landscape, general contracting, and rental. Features on the excavator include a long arm with integrated thumb mount and a max dig depth of 3.78 m.
Takeuchi Fleet Management telematics system or TFM comes standard on the unit. This system allows the owner to view machine vitals, location, utilization, performance, and maintenance data remotely and can be instrumental in ensuring machine uptime and availability. A 4-pump hydraulic system provides exceptional multi-function capability and precision pilot joysticks deliver smooth, metered control. The TB250-2 is also an excellent attachment platform. The primary auxiliary circuit delivers 91.6 l/min and is controlled using a proportional slide switch located on the left hand joystick. The multi-function monitor makes it possible to adjust hydraulic flow rates from the cabin, and multiple presets allow attachments to be exchanged quickly and easily. Additionally, detent mode provides continuous oil flow for various types of hydraulically-driven attachments helping to improve efficiency and reduce fatigue.